Dual mode operation: can be operating on electric power at night and solar power at day time. Inbuilt MPPT tracking facility to get maximum power output from the solar Array. Solar Panel: IEC 61215 & IEC 61730 Certified solar panels with 35 year life. AC Motor + Pump: High life cycle pump with High efficiency and better discharge. Solar AC Pump Controller: Transformer less high efficient and micro controller based pump inverter. Module mounting structure: Galvanized Iron Mounting Structure with Dual Axis manual/auto tracking facilities for long time operation in a day. Accessories: Cable, Connectors, Pipe and other Accessories. A transformer less inverter system, 415 VAC 3-phase output voltage and V/F Control to manage pump starting condition (Soft Start). 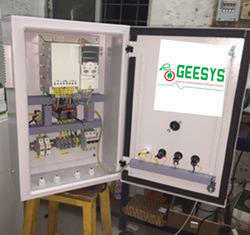 The equipment is micro controller based and operated with software for digital control of inverter parameters, fault finding diagnostics and digital I/O signalling. With the inbuilt MPPT (maximum power point tracking) function, it regulates the output frequency according to irradiation in real time to achieve the maximum power. Adopting the proposed dynamic VI maximum power point tracking (MPPT) control method, fast response and stable operation can be possible, better than the conventional methods, it can overcome the problems including poor tracking performance, unstable or even cause water hammer damaging when the irradiation on the array changes rapidly. We have specialized this small drive series, for HVAC OEMs, with a powerful set of built-in features to benefit fan and pump applications. Set-up and control is intuitive and simple, allowing easy integration with building automation systems through embedded communication languages, such as BACnet. Save time and energy, while enhancing performance in booster pumps, and exhaust, condenser, supply, and return fans. Keeping track of the current market growth, we are manufacturing and supplying an intricately engineered range of Solar AC Pump Controller . 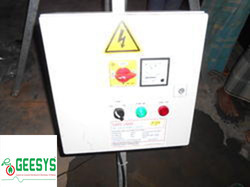 Offered in numerous technical specifications in synchronization with the application requirements of our respected clients, this controller comes with highly latest IGBT technology for high-tech micro-controller and Power conversion. In addition, it features inbuilt MPPT controller to control pump frequency in accordance with solar radiation for acquiring maximum power from solar panel. Features of Solar AC Water Pumping System: Intelligent v/f control method to manage AC pump with constant water flow output as per solar radiation Dual mode of operation solar or grid Water pumped even in morning, evening and in cloudy weather It can easily match with all kinds of ac submersible pumps Suitable for different environment with low maintenance cost Max. Operation temperature is 55 0 C It uses minimum system component with maximum output compare to conventional controller Soft starting of pump which controls initial inrush current Inbuilt MPPT tracking facility to get maximum power from solar array Transformer less design so Light weight and easily transportable Higher efficiency with long life Natural air cooling with high efficient anodized heat sink New design Automatic trip on fault Durable and highly reliable IP20 or IP65 Enclosure (Waterproof) as per customer requirement Advantages: Irrigation possible at Remote locations Environment friendly operations Conventional grid electricity can be use at night for Irrigation Highly reliable and durable Eco-friendly (Zero Noise Pollution -Zero CO2 Emission) No fuel Required Almost no maintenance required Provide consistent water Protection: Over voltage and under voltage protection Over load protection Sensor less Dry running protection Reverse polarity protection Phase imbalance protection short circuit protection Low radiation protection(if solar radiation is not so high to lift water from bore well then controller will give low radiation error and restart after half an hour) The controller will restart automatically on every half an hour in the faults of dry running, under voltage error but it will not restart automatically in the faults like Over load and phase imbalance LCD Display Parameters : Input DC Voltage Motor current Motor frequency Motor Run or Stop status All faults There are 3 LEDs on controller door one for displaying status of motor run or stop second for power and third for fault. 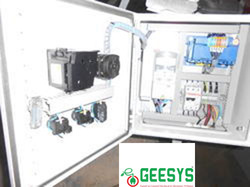 Solar Water Pump Controller We are a leading Manufacturer of SOLAR WATER PUMP CONTROLLER in Chennai, Solar Water Pump Controller with VFD Drive, SOLAR WATER PUMP CONTROLLER in Bangalore and Hyderabad. 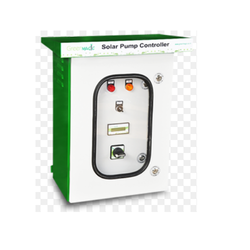 We have supplied SOLAR VFD Drive for 5hp and 3hp SOLAR PUMP CONTROLLER. This is also called as SOLAR PUMP INVERTER in India. We have Solar Pump Controller in 1-Phase and 3-Phase with different voltage ratings. 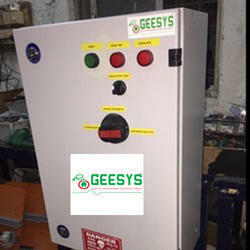 We customise the Solar Pump Inverter as per the customer and site requirement. SOLAR PUMP CONTROL PANELFrequent long-time electricity failure is a major problem today which affects water-pumping for major applications like Irrigation, Drinking-water supply Industry. Need of a permanent solution for water-pumping was necessary till date we have a solution for this problem. Everyday ample sunlight is available in Asia, which shall power our Solar DC pump sets for water-pumping applications. This Solar Energy can also be stored in battery these batteries can power the pumps during nights. 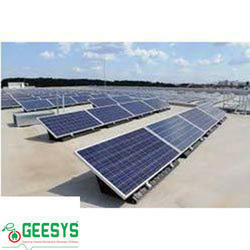 GEESYS Uses MPPT technology to maximize water delivery at various solar energy levels Water pumped even in the morning, evening and in cloudy weather at low speed/flow Can be used for both Monoblock or Submersible pumps. 1. Above scheme does not show the interlocks for running the drive with three phase supply. External contactor logic will be required for changing from DC to AC supply. 2.Safety interlocks and isolator must be used to isolate the drive from PV source are not indicated in this scheme. 1. 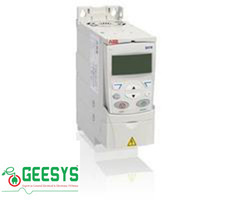 Drive selection: Sx2000 drive (400V class) drive as per motor rated current. Ex. If Vmpp of one panel = 30V then total panels required are 600 V / 30 V = 20 nos. 6. Proper enclosure shall be selected based on the site conditions. 7. In case drive to the motor, cable distance is higher than 150-200 feet, an AC reactor shall be used at the output drive. Half of the energy produced around the world is used to operate pumps. 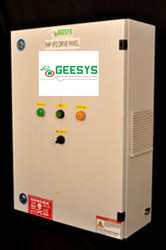 Compared to diesel generator pumps, the GEESYS solar pump drive is environmentally friendly, with a long lifetime and low maintenance costs. It is independent from the grid and produces no pollution or noise. Typical applications are irrigation, community water supply, fish farming and agriculture. Special functions for solar water pumping: To give optimal performance for solar water pumping,Solar VFD should offer special features for solar water pumps. a. In-built MPPT tracking algorithm without any need of external card in cabinet. Constant voltage mode (CVT) selection. The function of dormant state at weak light and automatic wake up at strong light. Adjustable delay time for weak light and wake up function. Level control function of high water level dormant state. Under-load pre-warning and protection functions to ensure normal operation of water pumps under changing operating conditions. Facility of connecting grid as well as dc input with pre-programmed changeover between them. RS485 communication facility. Optional panel accessory of data logging through GPRS block. We are a most trusted name in between the topmost companies in this business, instrumental in offering high quality array of Solar PV Power Plant. 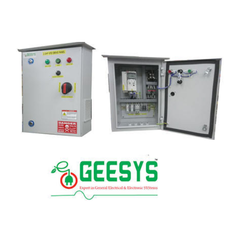 Solar Water Pump Controller We are a leading Manufacturer of SOLAR WATER PUMP CONTROLLER in Chennai, Solar Water Pump Controller with VFD Drive, SOLAR WATER PUMP CONTROLLER in Bangalore and Hyderabad. We have supplied SOLAR VFD Drive for 5hp and 3hp SOLAR PUMP CONTROLLER. This is also called as SOLAR PUMP INVERTER in India. The HT Solar Pump Controller is designed to run any Electric three phase submersible pump/motor. The HT Solar provides water in remote location by converting high voltage direct current (DC) from a solar panel into alternating current (AC) to run a standard AC Submersible motor. 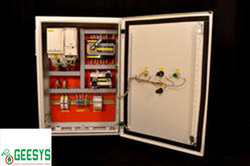 The controller provides fault detection, motor soft start, and flow control. This controller is designed to provide these features with the plug and play ease of installation similar to a single-phase control box. The controller attempts to drive the pump motor to deliver water even under adverse conditions reducing output as necessary to protect the system components from damage and only shutting down in extreme cases. Full operation is restored automatically whenever abnormal conditions subside. High flow system for faster tank fill and significant water output. Proven motor and pump technology with reliability. Robust IP54, NEMA 3 drive enclosure minimises impact of wildlife, insects, dust and weather. DC and AC power inputs with manual switching for generator back-up. LCD display shows speed(%), inputs DC voltage, output AC voltage and current with system status. Remote telemetry capability through a RS 485 continuous data port. MPPT- Max Power Point Tracking for maximizing the efficiency of input power. Soft start feature prevents water hammer and increases system life. Simple installation and required less maintenance. Uses MPPT technology to maximize water delivery at various solar energy levels. The HT SOLAR PUMP CONTROLLER products include diagnostic Features and protection from harmful conditions. 7. In case drive to motor cable distance is higher than 150-200 feet, an AC reactor shall be used at the output of drive. Frequent long-time electricity failure is a major problem today which affects water-pumping for major applications like Irrigation, Drinking-water supply Industry. Need of a permanent solution for water-pumping was necessary till date we have a solution for this problem. Everyday ample sunlight is available is Asia, which shall power our Solar DC pump sets for water-pumping applications. This Solar Energy can also be stored in battery these batteries can power the pumps during nights. Uses MPPT technology to maximize water delivery at various solar energy levels Water pumped even in morning, evening and in cloudy weather at low speed/flow Can be used for both Monoblock or Submersible pumps. Solar Panel: IEC 61215 IEC 61730 Certified solar panels with 35 year life. It consists of an array of solar panels connected in series and parallel combination to achieve the desired voltage and current necessary to drive the ac pump. The power rating of the solar array will be suitable to the design of the pump. Galvanized iron dual axis manual tracking structure will ensure the long time hassle free operation. Optionally we will provide auto tracking or fix tilt tracking. HDPE/GI ISI Standard Pipe for Higher Strength and easy installation with higher life expectation. ISI standard copper cable to ensure fire proof operation. Solar energy is converted into DC power with the help of PV cells. This DC power can be used for running the DC applications or it can be inverted then used for industry, farms, civil water supply, home appliances etc. Beta offers Sx2000 series AC drives can take DC input from solar cells run various types of pumps like submersible pump, surface pump etc. in the farm or the industry. Beta drives hasbuilt-inMPPT which varies the water flow depending on the solarintensity keeping output power equal to input power to achieve the maximum head or flow. These drives can run on solar power or can also take three phase input from grid supply. 2. Total Vmpp = 560 to 610 VDC. 4. Total Voc should not be higher than 760VDC. I^2.t mentioned in above chart shall be referred, if different make of fuse is to be selected for the application. Above ratings are for 400v class drives. Please contact beta for 200V class drives.